Seven years ago, when Elliot and I moved to Florida, some of my favorite flower bulbs joined us on the journey to the "Land of Flowers". Stately red cannas had been the flower of choice for a garden patch on the farm in Virginia. They were planted in honor of Mary Magdalene. Cannas, along with scented ornamental ginger, and bearded irises, were heading south to set down new roots. This morning, what a delight. 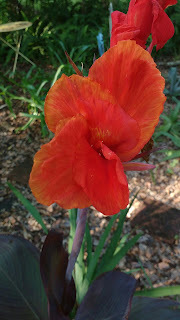 I was greeted by a tall red headed beauty dressed in a maroon variegated leafy gown. Yesterday's rain had not dampened her spirit, she had yet another bloom in the wings that had opened wide to greet the day. 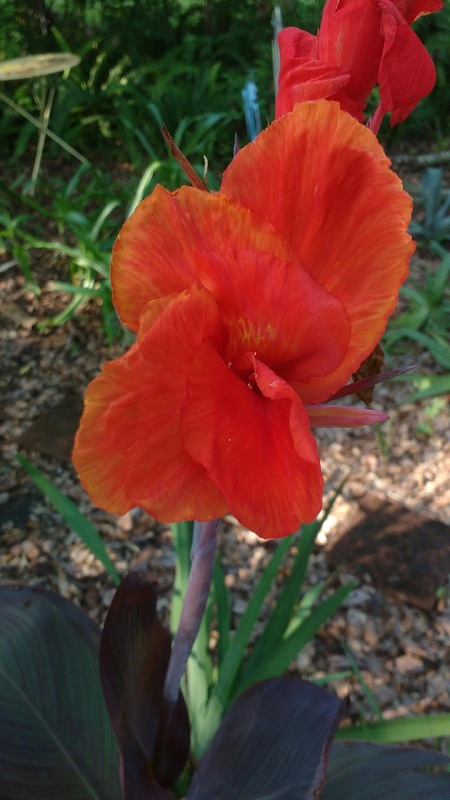 An on-line search revealed that cannas symbolize to Confide in Heaven. 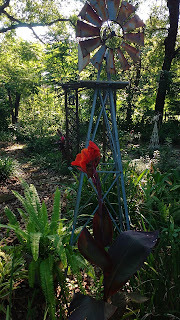 To confide is to trust or have faith in...I loved this message as cannas rarely bloom in the garden here so when one pops, I know it's a gift from the angels. God is Love.